The subscription for initial public offering of diagnostics company Metropolis Healthcare will begin on April 3. It is the first public issue of current financial year 2019-20. It is an offer for sale by promoters, which will close on April 5. Equity shares are proposed to be listed on BSE and NSE. Metropolis Healthcare (MHL), one of the leading diagnostics companies in India, by revenue, offers clinical laboratory tests which are used for early detection and diagnostic screening of a disease. MHL also offers analytical and support services to clinical research organizations for clinical research projects. It has presence across 19 states in India, as of December 31, 2018, with leadership position in west and south India, according to Frost & Sullivan. During the nine months period ending December 31, 2018, MHL conducted approximately 12.3 million tests from approximately 6.6 million patient visits as compared to approximately 16 million tests from approximately 7.7 million patient visits during the financial year 2018. MHL conducts operations through their laboratory and service network. They implemented a ‘hub and spoke’ model for quick and efficient delivery of services through their widespread laboratory and service network, which covers 197 cities in India, as of December 31, 2018. The company offered a broad range of approximately 3,487 clinical laboratory tests and 530 profiles, as of December 2018. 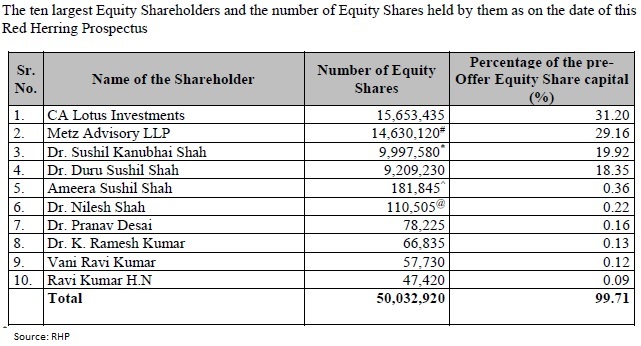 The 1,36,85,095 equity shares public issue is an offer for sale by promoter Dr Sushil Kanubhai Shah and investor CA Lotus Investments. They will sell up to 62,72,335 equity shares and up to 74,12,760 shares through issue, respectively. The offer includes a reservation of up to 3 lakh equity shares for subscription by eligible employees. The price band for issue is Rs 877-880 per share. Bids can be made for a minimum lot of 17 equity shares and in multiples of 17 equity shares thereafter. The company is expected to raise Rs 1,200.18 at lower end of price band and Rs 1,204.3 crore at upper end. As it is an offer for sale, Metropolis will not receive any proceeds from the offer. All the proceeds will be received by the selling Shareholders, in proportion to the offered shares sold by the respective selling shareholders. 7) Experienced Senior Management Team and Qualified Operational Personnel. 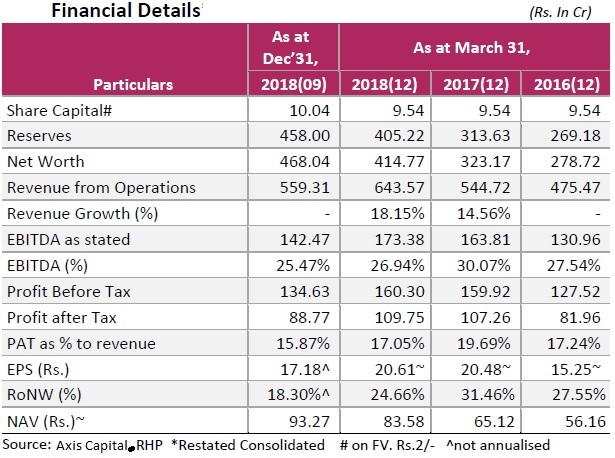 From financial year 2016 to financial year 2018, revenue from operations grew from Rs 475.47 crore to Rs 643.57 crore, representing a CAGR of 16.3 percent and profit for the year grew from Rs 81.95 crore to Rs 109.75 crore, representing a CAGR of 15.7 percent. Revenue from international business was Rs 40 crore in 9MFY19 and Rs 52.07 crore in FY18. Outside India, it has laboratory operations in Ghana, Kenya, Zambia, Mauritius and Sri Lanka. 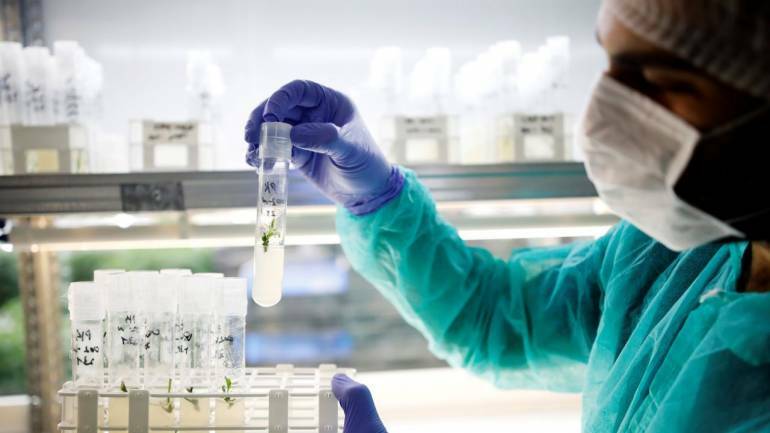 In addition, it has also entered into agreements with third parties for collection and processing of specimens in Nepal, Nigeria, UAE and Oman. At the time of filing Red Herring Prospectus, promoters (including through their nominees) and promoter group collectively hold 67.80 percent stake in company. Sushil Kanubhai Shah is the Chairman and Executive Director of the company. He was one of the partners of Metropolis Healthcare Services and Metropolis Lab. He has more than three decades of experience in pathology business. He has been a Director on our Board since 2005. Ameera Sushil Shah is the Managing Director of company. She was one of the partners of Metropolis Healthcare Services and Metropolis Lab. She has more than two decades of experience in pathology business. She has been a director on our board since 2008. Mihir Jagdish Doshi is the non-executive and non-independent director while Vivek Gambhir, Sanjay Bhatnagar and Milind Shripad Sarwate are independent directors on the board. Vijender Singh is the Chief Executive Officer and is responsible for overseeing the operations, business development and compliances of company. Prior to joining Metropolis, he worked with Dr Lal Path Labs, Ranbaxy Laboratories, Bausch & Lomb India and Blow Plast. Tushar Karnik is the Chief Financial Officer, and Jayant Prakash is the Head Legal, Company Secretary, and Compliance Officer of company.